ChoiceAmerica Insurance offers basic travel insurance coverage to non-U.S. citizens traveling to the United States, Mexico or Canada. This temporary insurance plan is a fixed benefit plan with travel medical benefits including outpatient treatment, in-patient treatment, ambulance services, emergency medical evacuation, and more. Choice America Insurance covers trips between 5 days to 364 days and allows anyone covered under the policy to visit any doctor or hospital of their choice. ChoiceAmerica Insurance is an excellent policy in providing coverage for international travelers to the U.S., Mexico, and Canada, especially elderly travelers like parents, traveling from the Indian sub-continent or Asia. With the recent administrative orders resulting in travel bans on some inbound travelers, ChoiceAmerica provides coverage for expenses due to border entry denials. Should a traveler experience a flare up of a pre-existing condition while traveling, ChoiceAmerica offers a limited pre-existing condition rider, unlike most travel medical insurance policies that only allow coverage for an acute onset. This policy is also great for travelers taking an adventurous trip, as it includes adventure sports and amusement park injury coverage as well as coverage for the loss of a passport or essential travel documents. While ChoiceAmerica Insurance is a limited coverage or budget plan with fixed benefit coverage, it is top in its class of insurance in providing travelers with essential benefits for all of their travel and health related needs, letting them enjoy their travels with less stress and more peace of mind. ChoiceAmerica Insurance offers short-term medical coverage for non-U.S. citizens traveling to the U.S., Mexico, and Canada at an affordable, competitive cost. 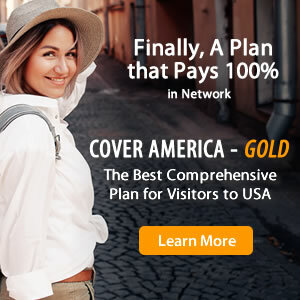 While ChoiceAmerica is a limited coverage plan, it is at the top of its class in providing travelers with essential benefits for all of their travel related needs. Not only does the plan provide coverage for basic medical necessitates, expenses related to port of entry discrepancies, and loss of passports and essential documents, but it also provides travelers with limited coverage for dental, vision, pre-existing conditions, and adventure sports and amusement park injury as optional add-ons to their plan. Non-U.S. citizens traveling to the U.S., Mexico or Canada. How to Buy ChoiceAmerica Insurance? I took this insurance couple of times. I won't say its a bad choice but its not recognized by Walgreens or physiciansimmediatecare.com. I had to pay out of pocket in both these places. Reimbursement process is really difficult too and there is no easy way to check the progress too. Their support is good and help full but i ended up paying full amount and still waiting for the reimbursement. I had a good experience, not bad. The online chat i used for support and clarifications is limited to some particular time. Might be useful if the time frame increased. Can't type the whole issue again. I guess that'll be done soon as the company grows. Didn't receive any periodic status about the claim I filed. Would be nice if we get informed about the status of the claim may be weekly (so that the company is still considering the claim and doing the claim procedure). After all, no company is 100% perfect. thank you for sharing your feedback about Choice America. We want to learn more about how we can improve to better serve you in the future. Please contact us with your comments and suggestions. Disclaimer: Information presented here is high level and for your convenience only; it may not be accurate and is subject to change. Please review your policy document or brochure for the terms and conditions, a detailed description of coverage, benefits, limitations, and exclusions.